2018 Bowman Draft Baseball Hobby Jumbo 8 Box Case FACTORY SEALED PRESELL 12/14/18. This Product Is Scheduled To Release On 12/14/18. Configuration: 8 boxes per case. 2018 Bowman Draft Baseball will continue to be the first MLB-licensed cards of the 2018 MLB Draft class that are available to the public. The 2018 Bowman Draft Baseball Jumbo Box offering will feature three on-card chrome autographs per box, along with a mix of new insert content and Base Cards of top MLB Draft picks. Bowman Draft Baseball is the very first trading card set that features base cards and autographs of the games future stars in their MLB uniforms. The 2018 base card set will include 200 subjects, each with an assortment of paper and refractor parallels. Base Cards 2018 MLB Draft picks and top prospects on paper technology. Sky Blue Border: sequentially numbered to 499. Purple Border: sequentially numbered to 250. Blue Border: sequentially numbered to 150. Green Border: sequentially numbered to 99. Gold Border: sequentially numbered to 50. Orange Border: sequentially numbered to 25. JUMBO BOX ONLY - Red Border: sequentially numbered to 5. Chrome Base Cards The same subjects as the base cards, on chrome technology. Refractor - Sky Blue Refractor: sequentially numbered. JUMBO BOX ONLY - Purple Refractor: sequentially numbered to 250. Blue Refractor: sequentially numbered to 150. Green Refractor: sequentially numbered to 99. Gold Refractor: sequentially numbered to 50. Orange Refractor: sequentially numbered to 25. JUMBO BOX ONLY - Red Refractor: sequentially numbered to 5. NEW INSERT SETS IN 2018. New inserts, as well as returning subsets, will highlight 2018 Bowman Draft Baseball, and feature both top prospects and 2018 MLB Draft picks. Image Variations Featuring the top 2018 MLB Draft picks and prospects in the base set. Look for on-card, autograph variations! Franchise Futures Showcasing a combination of two 2018 MLB Draft picks from the same franchise. Recommended Viewing A dual-subject card featuring prospect combinations. 1998 Bowman - 20th Anniversary Featuring the top players from the 2018 MLB Draft on the 1998 Bowman design. Bowman Sterling Continuity Picking up the continuity design, Bowman Sterling will feature the top players from the 2018 MLB Draft. Atomic Refractor: sequentially numbered to 150. Parallels for all insert sets (excluding Image Variations and Bowman Sterling Continuity) listed above will include: - Refractor: sequentially numbered to 250. Red Refractor: sequentially numbered to 5. Each Jumbo Box of 2018 Bowman Draft will contain three autograph cards, while each case will deliver at least 1 Class of 2018 Autograph case hit! Chrome Draft Pick Autographs Featuring on-card autographs of the top 2018 MLB Draft selections. Refractor: sequentially numbered to 499. Purple Refractor: sequentially numbered to 250. Blue Wave Refractor: sequentially numbered to 150. Black Refractor: sequentially numbered to 75. Sparkles Refractor: sequentially numbered to 71. Gold Wave Refractor: sequentially numbered to 50. Red Wave Refractor: sequentially numbered to 5. Black Wave Refractor: numbered 1/1. Class of 2018 Autographs 1 per case! Exclusively featuring top 2018 MLB Draft selections. Draft Night Autograph Cards Images of 2018 draftees from the 2018 MLB Draft event. Recommended Viewing Dual Autograph Cards Sequentially numbered to 99. 1998 Bowman - 20th Anniversary Autograph Cards Sequentially numbered to 99. Bowman Sterling Continuity Autograph Cards Sequentially numbered to 99. Select boxes of 2018 Bowman Draft Baseball will continue to feature incremental content! Top of the Class Box Toppers JUMBO BOX ONLY Featuring the biggest names from the 2018 MLB Draft class on an oversized chrome card. Autograph Parallel: sequentially numbered to 35. Under Armour Game Autographed Cards Autographed Cards from previous Under Armour All-American high-school showcase games. 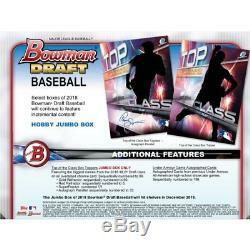 The item "2018 Bowman Draft Baseball Hobby Jumbo 8 Box Case FACTORY SEALED PRESELL 12/14" is in sale since Friday, November 30, 2018. This item is in the category "Sports Mem, Cards & Fan Shop\Sports Trading Cards\Baseball Cards". The seller is "7stretch" and is located in Cooperstown, New York. This item can be shipped to United States, Canada, United Kingdom, Denmark, Romania, Slovakia, Bulgaria, Czech republic, Finland, Hungary, Latvia, Lithuania, Malta, Estonia, Australia, Greece, Portugal, Cyprus, Slovenia, Japan, China, Sweden, South Korea, Indonesia, Taiwan, South africa, Thailand, Belgium, France, Hong Kong, Ireland, Netherlands, Poland, Spain, Italy, Germany, Austria, Bahamas, Israel, Mexico, New Zealand, Singapore, Switzerland, Norway, Saudi arabia, United arab emirates, Qatar, Kuwait, Bahrain, Croatia, Malaysia, Brazil, Colombia, Panama, Jamaica, Barbados, Bangladesh, Bermuda, Brunei darussalam, Bolivia, Ecuador, Egypt, French guiana, Guernsey, Gibraltar, Guadeloupe, Iceland, Jersey, Jordan, Cambodia, Cayman islands, Liechtenstein, Sri lanka, Luxembourg, Monaco, Macao, Martinique, Maldives, Nicaragua, Oman, Peru, Pakistan, Paraguay, Reunion, Viet nam.